The skylight has fallen! Where does the rain go? Where are the birds going? With all of this moisture is your home safe? Is your attic and the wiring and insulation wet? Professional Home Inspector, Rich Parker found this while inspecting a roof in Dallas, Texas. 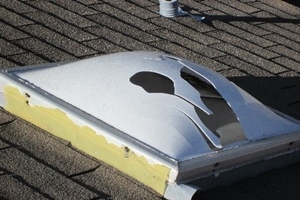 There are some items that are not working properly on our roofs yet we don’t often get up on the roof but this failure can be seen from inside. If you home is your forever home, if you are about to put your home on the market or if you are purchasing a home then hiring a Home Inspector to come check your home out from top to bottom is worth the investment.